Latitude 38 is the ABSOLUTE BEST in Telluride! We were very happy, met all our needs. Well-appointed, modern kitchen, large dining room table plus bar seating...plenty of paper products, toiletries, hair dryers, comfortable beds and living room couches. Easy walk to Cookskin lift as well as into town. Staff extremely friendly. Would definitely book again. We were really happy with the property! We loved its many beds upstairs, and its close proximity to the Coonskin ski lift. It was an easy walk to main street in Telluride, plus the Galloping Goose shuttle was available (though we never used it). We also liked how close we were to the grocery store. We did quite a bit of cooking in the house, too. This property exceeded our expectations in every way. Other than not having much of a view out the windows, everything else was great. 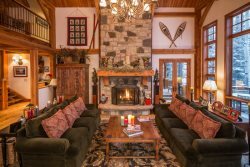 It was a relief to finally find a ski condo that does not look like some cliche version of a cowboy lodge. The apartment is spacious, modern, very well appointed, and comes with top-end equipment in every category. Wolf stove, Sub-Zero fridge, AllClad cookware, lots of OXO products, remote control fireplace, big smart TV, good internet speed, great Jacuzzi bath, etc... It is also very well stocked with all of the basic supplies you may need for the stay. Loads of towels, paper towels, napkins, tissues, grilling skewers, fire starter, etc... There is a ski room in the garage which is directly below the unit via the elevator just outside the apartment door. The ski slope is exactly 160 steps on a heated driveway from the garage exit - a very convenient ski in and ski out location. It is also just directly across the street from the only supermarket in Mountain Village, which makes home-cooked meals a breeze in the spacious kitchen. It takes only 8 minutes to get to the center of Mountain Village via the free gondola from the apartment door. The rental agent, Latitude 38, did a great job managing the property and communicating with us throughout the process. They were very responsive to our requests by phone and by email. They also offer concierge service and other amenities belonging to Latitude 38 like ski lockers and lounge near the ski slope. But since the apartment is so conveniently located, we did not find it necessary to use these additional services. The only suggestion I have for the owner of the unit is to perhaps change the water heater to an on-demand instant hot water system, which is more energy efficient, takes less space in the mechanical room, and will provide endless hot water on-demand (which has not been a problem since the plumber fixed the broiler problem we initially had). We have rented many ski houses and condos in the past, and I would recommend this unit with no reservations whatsoever. Enjoy. We LOVED the property. Wished it was for sale and I could buy it! Next time we visit Telluride we will definitely try to stay there. But if it is booked, we will definitely find another Latitude38 property to rent. We have had nothing but excellent times at the properties offered by Latitude38. I recommend your company to all of my friends! Really nice condo, ideal location. We were very impressed with your service too. You all were first class all the way around and very helpful on many levels (ski rentals, dinner suggestions, lift tickets). This place to beautiful and so very comfortable for our family of 4. It's location is perfect....close to the gondola and ski hill plus it's SO quiet and has a wonderful view. So easy to make a reservation and communicate with the staff. Property is gorgeous and perfect for our needs. This property has everything we need for our perfect ski vacation. We love the location...close to the gondola and right on the ski hill but additionally I love all the details that make our stay comfortable...great cookware, plenty of towels, lots of soaps and paper products and the humidifiers in the bedrooms were great. We have stayed in many different condos on our travels and these small details seem trivial but really put this place on top. My family and I have been visiting Telluride for years, and this is by far our favorite place to stay when we visit! The condo has breathtaking views of the mountains, is beautifully decorated, very spacious, clean, and stocked with all the essentials every time we arrive. It's rustic and cozy, but modern and elegant, exactly what we are looking for in a mountain getaway. It's our home away from home! The property, Cassidy Ridge, is stunning, private, and luxurious. It's also centrally located with shops and restaurants nearby, and the best part is there's a complimentary shuttle ready to pick you up and take you where you're going within minutes. As avid skiers, it's important that we're able to hit the slopes as quickly and conveniently as possible each day. With the Latitude 38 service that is offered, grabbing our ski gear and getting to the slopes early while the powder is untouched is a breeze. It's the best! Every time we stay here we are well taken care of, relaxed, and able to enjoy our trip to the fullest. We'll never stay anywhere else.